It's that interesting phenomenon, Leap Year Day. February 29 was added to balance the calendar. It has something to do with the earth's revolutions around the sun and the need to add a day to catch up, so to speak. People born on this day must have really fun celebrations when their actual birthday rolls around and leap years also coincide with presidential election years. BOCES class starts Monday. I'll be tired for the next six weeks. Ah well, that's life. 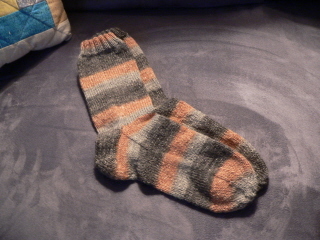 The yarn for these socks is called Austermann Step. Jojoba oil and aloe vera are added to the yarn, and this is supposed to soften your feet while you wear them. I wore them all day today. They're comfortable, but I don't know any more than that! By the way, the colors aren't accurate at all. They're really two shades of green and a brown color. Weird that I just can't get an accurate pic of these colors. I'm making a real effort to finish the UFOs. Unfortunately, I'm going to have less time at home and will be tired when I'm here and that won't help me accomplish this goal. I am almost finished with the gold cardigan. Will wonders never cease? Grand total yardage of the gray coopworth yarn is 433. It's a heavy worsted weight and I really don't know what to do with it. Right now, I mostly pet it. I am reading Without You by Anthony Rapp and I'm really enjoying it. It's beautifully written. I'm halfway through the book and I was reading it during a class today when I reached the description of the death of Jonathan Larson and the effect on the cast. My eyes were filled with tears. So sad and unfair. I had to watch Rent when I got home. Kelly and Lorelai were here. After the first song, Lorelai said, "I like that song." Kelly said, "I do, too." Time to get some sleep. I'm SO glad it's Friday! The superwash merino wool. It's so soft. Purple wool. I don't know what breed but it's very much like the gray coopworth. 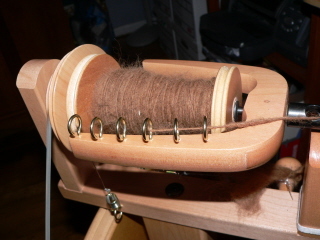 I have 319 yards of the gray wool and I finished spinning the rest of the fiber last night. I'll ply it today and see how much the grand total is. I still have more of the purple to spin. 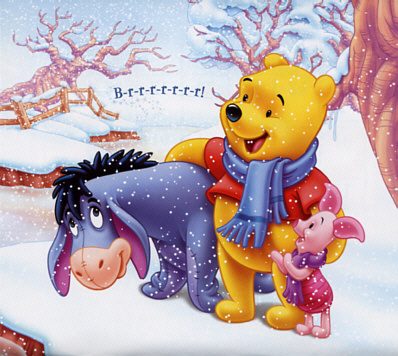 Wow, it's windy out there and tonight, there's cold weather promised. Ah well, the mild weather was nice while it lasted. We've seen very little of the white stuff so far this winter. This makes me nervous, to be honest. It's like waiting for the other shoe to drop. One of these days, our luck will run out. Getting the feeling I'm not a fan of snow? Well, I love to sit inside and look at it. I think it's beautiful. However, I hate driving in it and I'm not too terribly fond of the shoveling part of the situation either. I think the hassles outweigh the enjoyment in the long run. So, today's Groundhog Day. Did the groundhog see his shadow? Are we in for six more weeks of winter? Do I care? Nah! Remember this? Joshua's alpaca fleece? I brought some of this to the last spin guild meeting for advice on how to spin it. I wasn't getting very far because I didn't know how to prepare it. 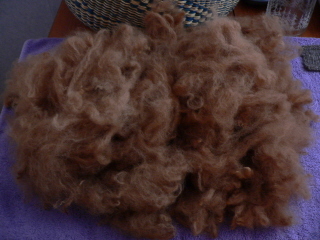 Carol, who is an amazing spinner, told me to get a dog comb and just fluff up the fibers to loosen them. 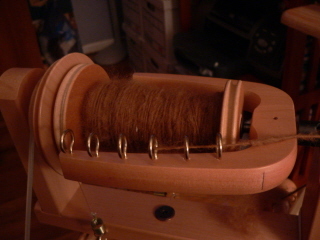 I tried that and I'm finally spinning this alpaca. It looks pretty good and it's so soft. 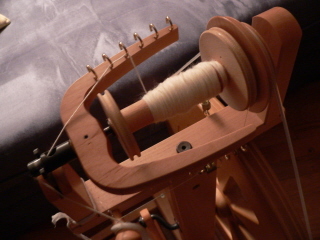 When I have another bobbin spun, I'll ply them and see how it looks. I have plenty so I should be able to get enough yarn to make a sweater. That's the ultimate goal. I have a design in mind. 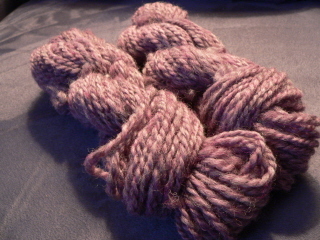 I also have some superwash wool I've been trying to spin. I was having all kinds of trouble. I couldn't seem to get enough twist in the yarn and the twist kept running up into the drafting zone. Very frustrating. This afternoon, I thought about what the problem could be and the only thing I could come up with was that I wasn't predrafting it enough. I tried loosening the fibers until the strand was almost transparent. Then, I tried spinning again. I had to go really slowly so the yarn didn't pull out of my hands. That seemed to fix the problem. I'm so excited about how this is spinning. It has a really nice twist. I don't know what I plan to do with it. I have a pound of this fiber and I have no idea what the final yield will be. I might decide to dye it or just leave it white. I'm actually leaning towards just leaving it white but it will depend on what I decide to knit with it. I'm really excited that I'm getting the hang of this because I have that beautiful fiber in the red colorway that I bought at Rhinebeck and I'm thinking it's merino. It feels very much the same as the superwash fiber. 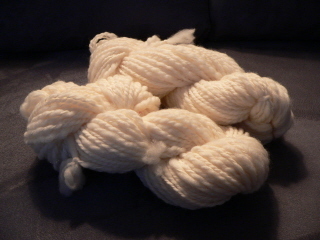 Once I've spun this white, I should be ready to spin the red. I'm also working with a beautiful light purple color, almost a lavender but a little darker. It's very much like the gray coopworth I've been spinning so it's spinning up beautifully. No pictures of that but I have two nice skeins. I'll take some pictures, maybe tomorrow. 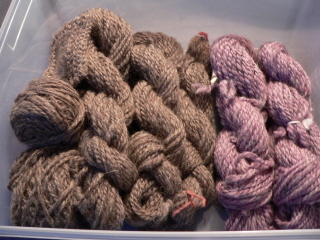 When I finish all the fiber I have here (and I have lots), I still have the beautiful gray Shetland fiber. I'm holding onto that until I feel really confident. I have a little more than a pound of that. 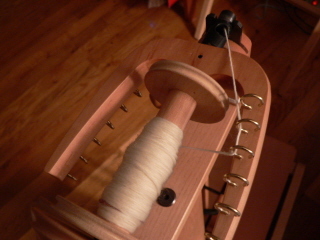 So far, though, I'm happy with my progress and enjoying myself spinning. The only problem is I keep adding yarn to the stash and not finishing enough projects. I guess that's not a bad thing, though, right?